Looking for a tasty vegetarian recipe? 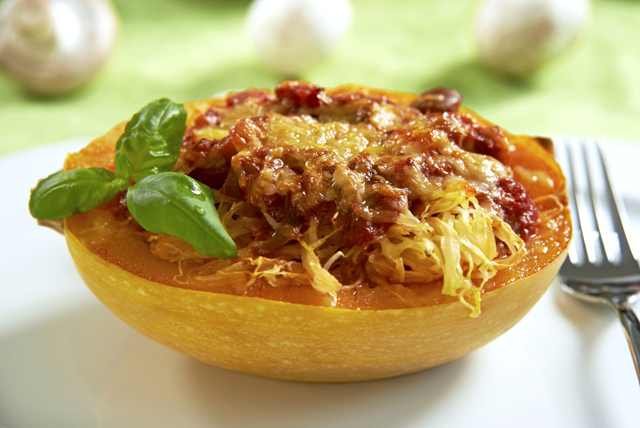 Our Cheesy Baked Spaghetti Squash with Mushroom Ragu fits the bill. And this hearty recipe is sure to be a hit with both vegetarians and meat-lovers alike! Use tines of fork to pierce skins of squash halves in several places to allow steam to escape; place, cut sides down, on parchment-covered baking sheet. Bake 1 hour or until tender. About 30 min. before squash is done, heat oil in large nonstick skillet on medium heat. Add onions; cook 5 min. or until tender, stirring occasionally. Add mushrooms; cook 7 min. or until mushrooms release most their liquid, stirring occasionally and adding garlic for the last minute. Reserve 1/2 cup pasta sauce for later use. Add remaining pasta sauce to mushroom mixture; stir. Simmer on medium-low heat 10 min., stirring occasionally. Remove squash from oven. Run fork over squash flesh to form spaghetti-like strands. Add to pasta sauce mixture in skillet along with the Parmesan and 1 cup shredded cheese; mix lightly. Spoon into squash halves; top with reserved pasta sauce and remaining shredded cheese. Bake 10 min. or until cheese is melted. Serve with a crisp tossed green salad and crusty whole grain bread. Garnish each serving with a sprig of fresh basil before serving.